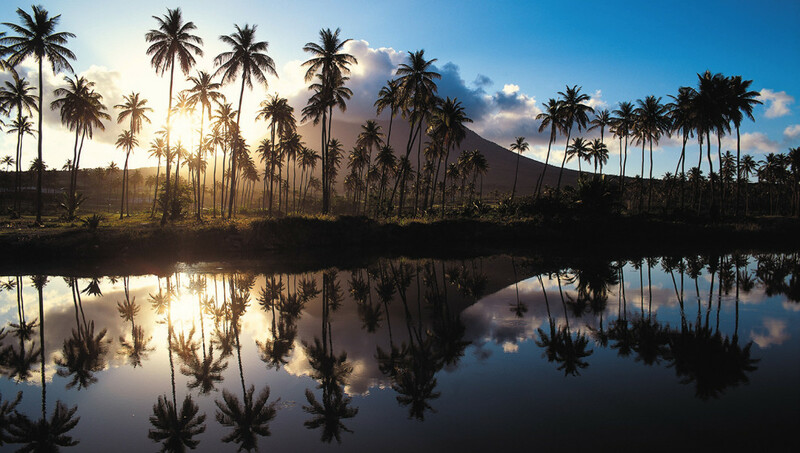 Until the hit musical Hamilton took Broadway by storm in 2015, few people had even heard of the sombrero-shaped island of Nevis (pronounced Nee-Vis), located in the West Indies northern Leeward archipelago. Unsullied by mass tourism, the exotic birthplace of Alexander Hamilton (one of the founding fathers of the United States), seems impervious to the glitz and glamour of other Caribbean atolls, favouring its own understated brand of island chic. Privacy-seeking celebrities like Michael Douglas, Meryl Streep and (more recently) Justin Trudeau, flock to its blissfully empty beaches, which are more sandy-hued than alabaster white. This minor geological inferiority, together with the absence of an international airport and cruise ship anchorage, has been a blessing. There isn’t a Starbucks in sight, a building higher than a coconut palm and the island’s naturalised Green Vervet monkeys outnumber locals by around two-to-one. As the island’s brooding volcano comes into view, crowned by a veil of puffy clouds and a cerulean sky, I start to understand why the breezy 20-minute water taxi ride from Nevis’ sister island, Saint Kitts, makes for a cinematic entrance. The towering peak is also the namesake of the island – christened Las Nievas (the snows) by Columbus in 1493, on account of its cloud-kissed summit, which reminded him of Spain’s snow-capped mountains. No sooner have I touched down on Four Seasons Resort Nevis’ pier and I’m whisked off to one of the resort’s private gingerbread-style beach cabanas where limin’ – the local lingo for doing nothing in particular – is de rigueur. Kitted out with a mini-library, flat-screen TV and a house attendant to cater to your every whim, “doing nothing” has never looked so stylish. But it doesn’t take long for the resort’s 4.8-kilometre-long Pinney’s Beach to seduce me with its come-hither swells. Snorkel and flippers on, I discover there is plenty of marine life to be explored off Four Seasons’ sheltered coral-rimmed shoreline, which teems with parrotfish, damsels, angelfish, snappers and trumpet fish. From June to October, guests can partake in nocturnal turtle walks along this moonlit beach as part of the resort’s on-going ecotourism project. 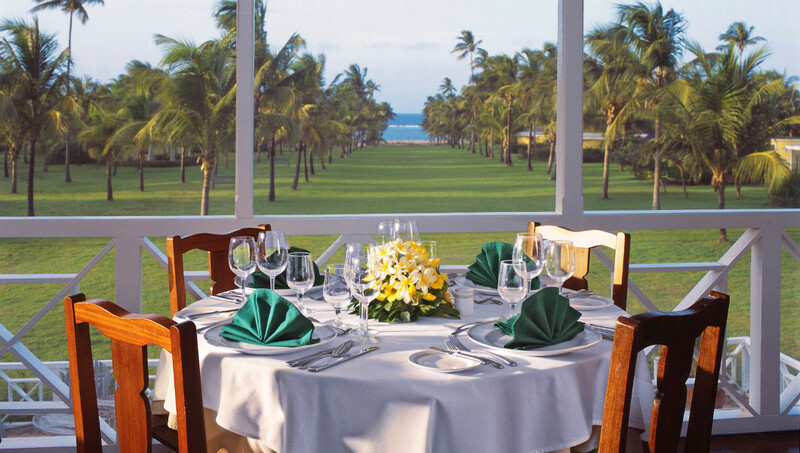 It’s also the spot to dive for your dinner (a spiny lobster that is), which is later cooked to perfection by the executive chef at the convivial beach barbecue. The mellow hum of steel pans and wafts of grilled seafood beckon me to the open waterfront deck of Mango’s – one of the resort’s four restaurants. With more than a hundred varietals of rum from Bermuda to Brazil, this is a good place to start your rum libation, which isn’t just a drink, but a way of life in the Caribbean. My thirst quenched, I flop into one of the Four Seasons’ zippy golf carts, skirting past the resort’s 10 tennis courts, three infinity-edged pools and 196 guest rooms and suites that nestle in its lush gardens. 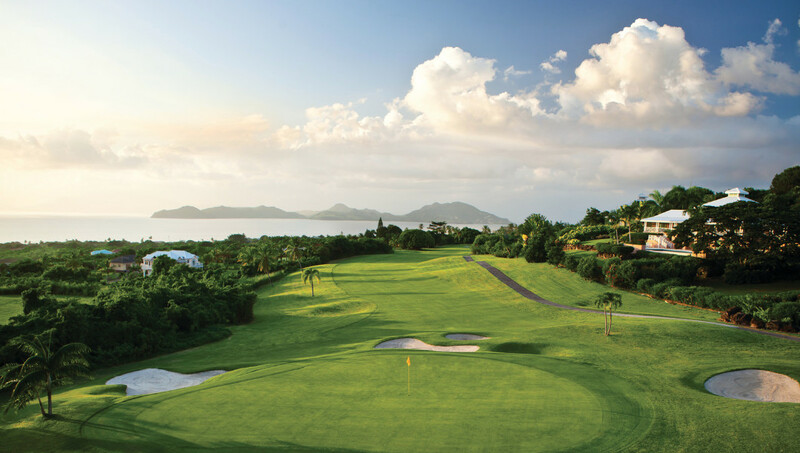 We take a scenic pause behind the second tee of the resort’s 92-acre, 18-hole Robert Trent II Jones golf course, where the dramatic ruins of a historic sugar mill resides, before assuming my horizontal position once more. An hour or so of limin’ later, I reluctantly scoop myself out of a sun-dappled hammock, and head out on the island’s only road, for the pastoral foothills of Nevis Peak. The trees take on a wilder form, the road gets rockier and free-roaming goats multiply as we approach Gingerland – an area once overrun by ginger crops, and now home to one of the island’s most idyllic hideaways; The Hermitage. Fruits rather than spices now conquer this land, with towering mango and tamarind trees cradling the eight macaroon-coloured, gingerbread-pointed cottages that are scattered across a sloping estate. The hotel’s hands-on owner, Richard Lupinacci, animatedly tells me how he salvaged these local chattel houses when the family bought the estate in 1971. Like a proud dad, he excitedly gives me a tour of The Great House, which dates back to around 1670 – making it the oldest wooden building in the Caribbean, and an atmospheric setting for the hotel’s West Indian feast nights, held every Wednesday. Guests prop up the old-English pub-style bar before honing their Caribbean palates on local dishes like fried fish and Johnny’s cakes (the island’s national dish), lemongrass and coconut milk soup, rabbit pie and the table’s centrepiece – a suckling pig that’s been slowly roasted for hours on an open fire. My retreat for the afternoon – The Hermitage’s 18th century colonial-styled library, decked out in oriental rugs and antique furniture, feels more like an English old-fashioned family home, albeit a rather grand one. One sip of the house rum punch (concocted from a 350-year-old family recipe), and a dip in the glorious freshwater pool promptly reminds me of my Caribbean postcode. The Hermitage is just one of a handful of sugar-plantation-homes-turned- boutique-hotels that are as much portals into the island’s rich history, as they are stylish boltholes. Just around the corner is another hilltop hideaway that prides itself on low-fi, tropical seclusion. Owned by renowned New York artist couple Brice and Helen Marden, Golden Rock Inn is a mecca for design devotees who aren’t averse to being lulled to sleep by the chorus of tree frogs, or being woken up to the drone of hummingbirds. Brushing past enormous palm fronds, I navigate a path flanked by cacti, ficus trees and Norfolk pines to a citronella-yellow cottage (one of eleven such abodes) and my home for the next few nights. The indoor-outdoor living is reinforced with tropical-themed upholstery and a vivid colour palette inspired by the artfully overgrown jungle garden. An exquisitely carved four-posted bed and Moroccan rug complete the eclectic look. 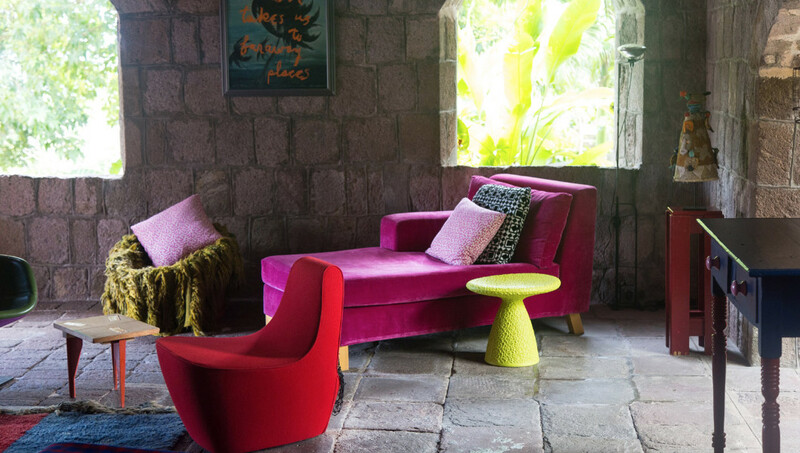 The 19th century sugar mill and counting house, meanwhile, blend old and new with fire-engine splashes of colour and striking sculptures, which pop against the grey, cut-stone walls. I settle down to a pre-dinner cocktail in Golden Rock Inn’s historic, vaulted bar, before dining in the indoor-outdoor colonnaded restaurant, designed by revered Aman hotels and resorts architect, Ed Tuttle. For a more intimate evening, guests can dine in the pavilion dome, inspired by copper kettles that were once used to boil the estate’s sugar cane. It was the sweet stuff that brought immense wealth to the island in the 18th century, and at one point this tiny speck in the ocean was the richest of the Leeward island’s, earning it the moniker “the Queen of the Caribbees”. One of Nevis’ best-preserved ruined sugar mills, which offers a fascinating glimpse into the island’s colonial past, is the New River Estate, located 10 minutes from Golden Rock Inn. Rusting hulks of crumbling sugar machinery, now reclaimed by Mother Nature, rest alongside the impressive remains of the huge steam engine that was used to crush sugar cane. Thetranquil spot also affords great views of Montserrat and Redonda, on the island’s wild Atlantic Side. To get even closer to nature, visitors can hike the island’s 985-metre dormant volcano with two-time Sportsman of the year and four-time National Cycling champion Reginald “Reggie” Douglas, who will happily impart his encyclopaedic knowledge of Nevis’s indigenous plants. The next best thing is the island’s Botanical Garden’s rainforest conservatory (a 15-minute drive from New River Estate) that houses the Caribbean’s largest collection of orchids, as well as a few resident parrots. Next door to the gardens is one of the Nevis’ most coveted dining destinations: Montpelier’s Mill Privée. Once a thriving plantation, the hotel is sequestered amidst tropical greenery (60 acres to be precise) at a lofty 228 metres above sea level. Guests can indulge in a candle-lit dinner in the world’s only sugar mill tower-turned restaurant. But this isn’t the Relais & Châteaux property’s only romantic claim to fame. It was here the famous nuptials between admiral Horatio Nelson and Nevisian Frances “Fanny” Nisbet took place in 1787. Their love story actually begun six years earlier at Nisbet – the Caribbean’s only historic plantation on the beach, which resides in all its colonial splendour on the island’s north eastern shores. Fast-forward 200 years, and romance lives on. Nisbet’s vast lawn, studded with 36 lemon-hued cottages, leads down to the sea and a quarter mile swathe of beach via a stately avenue of palms, which has become prime wedding real estate. The hotel will even plant a coconut tree for every couple that marries here. Sadly, I’m not here in the pursuit of love – rather the pursuit of gluttony, as I sit down for a colonial tea in the Great House, which dates back to 1778. Oozing old-world-charm in more ways than one, many of Nisbet’s employees have worked here for over quarter of a century. One of their longest standing, Maître d’ Patterson, greets me like a long-lost friend and shows me a few of his 4,000-strong tie-collection – gifted by returning guests. My island journey comes full circle as I pay a visit to Alexander Hamilton’s Charlestown family home-turned-museum. Nevis’ history really is far grander than its tiny landmass of 57.9 kilometres. The 9.6-km-wide by 12.8-km-long island was in many ways ahead of its time – as well as being the first island to open a hotel in the Caribbean (the Bath), it also laid claim to the first church (Cottle). Paradoxically, this beguiling island of the snows remains one of the least developed Caribbean islands. Maybe there’s something to be said for limin’ after all.